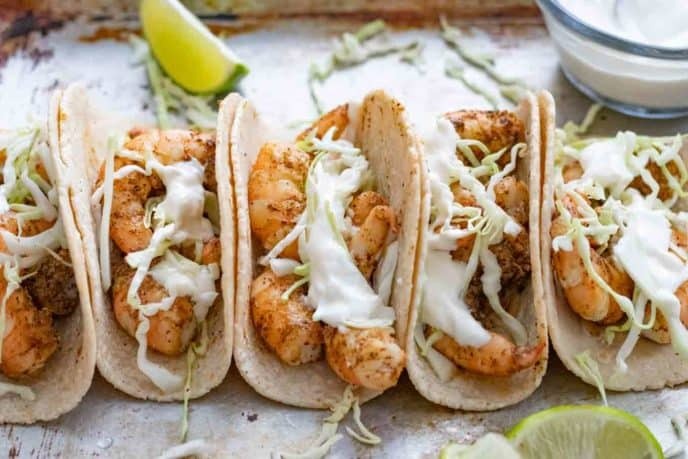 Shrimp tacos made with taco seasoning and topped with cabbage and sour cream are a quick and easy dinner that is perfect for healthy weeknight meals! 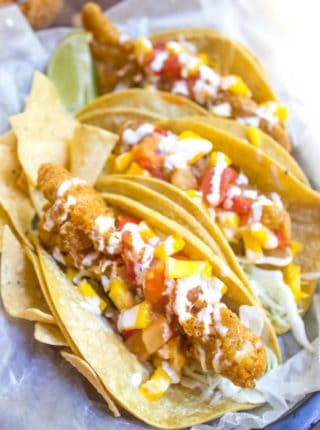 These tacos are a favorite in our house along side our Crispy Fish Tacos! Other popular shrimp dinners include Shrimp Scampi, Shrimp Boil and Shrimp Stir Fry. We love cooking shrimp (aka prawns) because it takes very little time and you can a bag of frozen shrimp in the freezer for last minute meals. With just a few minutes you can have a meal that tastes fresh and healthy and flavorful and it doesn’t take any fancy meal prep either. Shrimp are the perfect protein for a quick dinner. The key to restaurant style shrimp dishes is to layer flavors and textures. 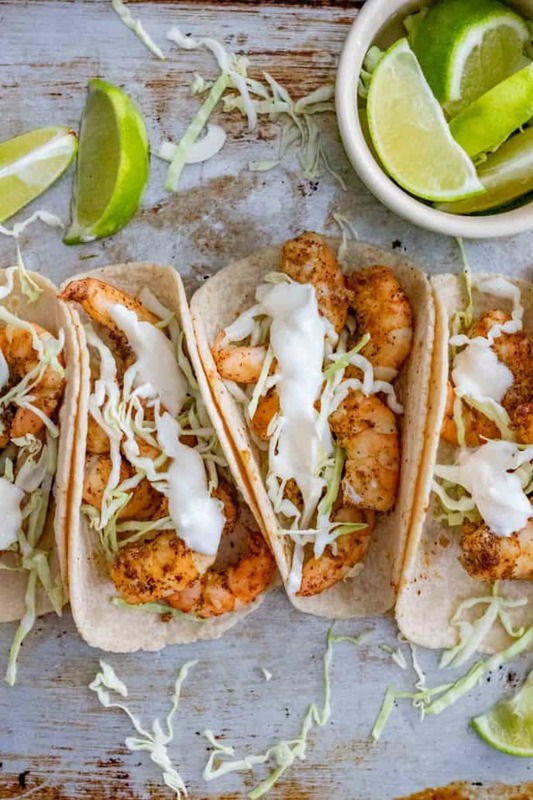 In this shrimp taco recipe we use a spice blend of chili powder, cumin, garlic powder, and cayenne pepper. 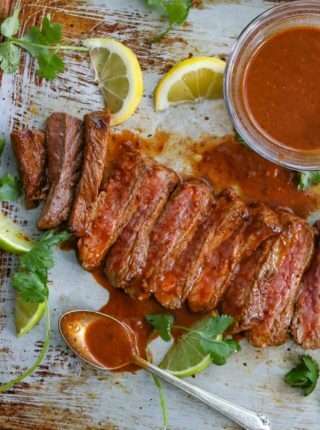 Lime juice brightens the seasoning blend and brings the flavors together. The shrimp is coated with the taco seasoning then sautéed for only 1 minute per side. A crunchy cabbage slaw is a healthy topping for these corn tortilla folded tacos. If you want to make the recipe low-carb you can also serve the shrimp in lettuce cups instead of using tortillas. Shrimp tacos are a healthy taco option if you keep the toppings under control. 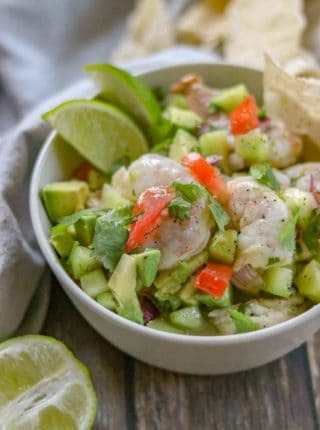 With just a bit of olive oil, using lettuce wraps or small tortillas and fresh vegetable toppings (or avocado) you can make them part of your regular meal rotation. We love serving Mexican Rice, Shrimp Ceviche, Bean Dip, Queso and Homemade Lime Chips to make a fun party meal. Now lets make sure your shrimp are properly deveined before we go any further with these Shrimp Tacos. Tear away at the shell above the first segment of the shell (the tail segment). Take a paring knife and make a shallow cut along the spine (the back of it). To remove tails just squeeze out from the bottom of the tail segment. Mix ingredients well and refrigerate for at least one hour. You can use sour cream instead of the crema or you can also use a spicy mayonnaise made with 1 cup mayonnaise mixed with 2 tablespoons sriracha which is refrigerated for at least 1 hour before using. There are two methods recommended for thawing frozen shrimp. One is faster than the other so use the technique that works best for you! Overnight thaw method: Place the frozen shrimp in a large bowl. Cover with plastic wrap and defrost the shrimp in the refrigerator overnight. Drain the shrimp and pat dry before cooking. Quick thaw method: Place the shrimp in a colander and set it in the sink. Run the water over the shrimp for about 10 -15 minutes. Gently rotate the shrimp with a spatula after 5 minutes. The ice crystals will melt and the excess water runs down the drain. Pat the shrimp dry with paper towels before moving on with your recipe. Note: Do not freeze shrimp after it has been thawed. If you buy thawed shrimp from the store, ask your fishmonger if the shrimp has been previously frozen. Stovetop: In this easy shrimp taco recipe we cook the shrimp quickly in a large skillet over high heat. A cast iron skillet is a good choice because it retains heat well. Always preheat your skillet before adding the shrimp to the pan. Oven: Oven baked shrimp is one of my go-to methods. You can add vegetables to roast along side the shrimp too. Bake the well seasoned shrimp in a cast iron skillet or on a heavy duty baking pan at 425° for 5-7 minutes. Grill: If you want to learn how to grill shrimp, try this simple method. Season your shrimp with the seasoning rub then place three or four shrimp on a skewer. Grilled shrimp are cooked for 2 minutes per side. No matter what method you use to cook shrimp, the shrimp is cooked when it is slightly pink and still opaque. Shrimp cooks very quickly and overcooked shrimp is bright white and rubbery. Make perfectly cooked shrimp each time with these methods and remove the shrimp from the cooking vessel as soon as they are done. Cabbage Slaw: We love the simplicity of serving shredded cabbage on tacos. If you have time to elevate your cabbage to a cabbage coleslaw, try this easy cole slaw. Throwing together the coleslaw makes this shrimp dish perfect to share with company. Rice: Mexican Rice, Cilantro Lime White Rice or Brown Rice. Healthy cauliflower rice is a good choice and an excellent way to add more vegetables to your meal. Corn: Corn Salsa, Fresh corn on the cob or frozen corn pairs well with tacos. If you prefer you can use olive oil or avocado oil instead of vegetable oil. You can marinate the shrimp in the taco seasoning for 30 minutes, just do not add any citrus. You can make spicy shrimp by adding a bit of cayenne or sriracha to the marinade. If you’d like to make more of a sauce you can use a mix of tomato sauce, salsa and taco seasoning warmed in the skillet after cooking is done. Cilantro is not in the recipe but you can add dried cilantro in the seasoning mix or even chopped cilantro and onions as a topping for freshness. Heat your tortillas inside a wrapped foil pack so the tortillas stay moist. Once you learn to cook seafood at home, you’ll find that shrimp and fish are great proteins to include in weeknight meals. Try these seafood recipes! Do you love Mexican food? You will also enjoy our recipes that will turn your Mexican buffet into a fiesta! 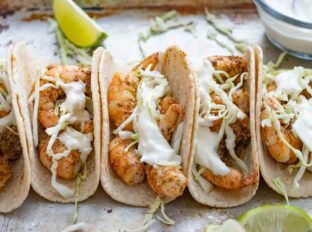 Shrimp tacos made with taco seasoning and topped with cabbage and crema are a quick and easy dinner that is perfect for healthy weeknight meals! Toss the shrimp with the chili powder, cumin, garlic powder, salt, cayenne pepper, lime juice and lime zest then add it to a large skillet with the vegetable oil on high heat. 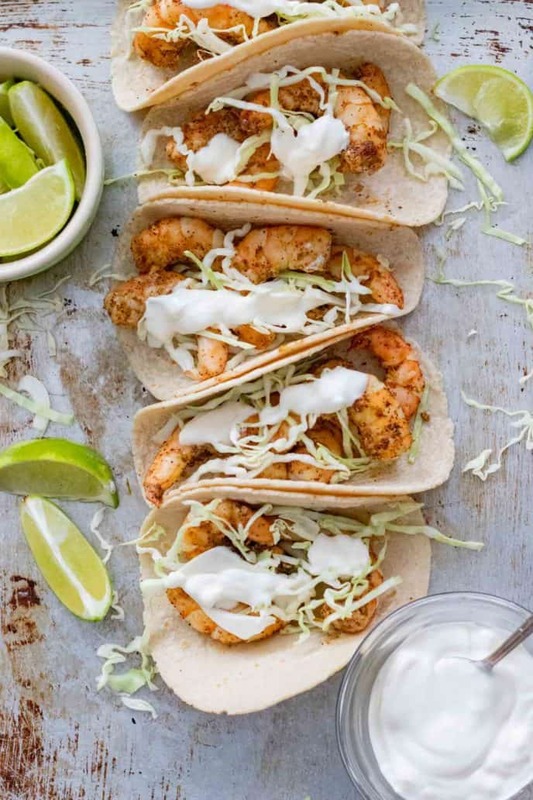 Cook the shrimp for 1 minute on each side until just cooked through and serve on double corn tortillas with cabbage and sour cream and lime wedges. I can consume these delicious Tacos anytime and anywhere. Best Dinner, breakfast or snacking option too. No judgement here, haha! Tacos are always a great idea. These look absolutely scrumptious! Great helpful hints too! I love all of the unique flavors, and the use of cabbage on your tacos! These are going on my Taco Tuesday list for sure! 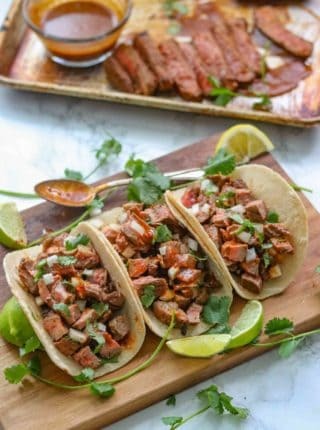 Can’t wait to make these for Taco Tuesday!! Thank you for a great recipe! I absolutely love that you used 4 shrimp on each. These look so delicious! Load it up, am I right? !